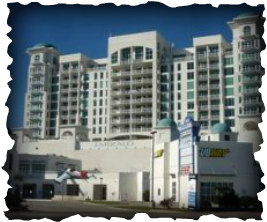 Emerald by the Sea Condominiums is located on the Seawall and looks over Stewart Beach. Built by Randall Davis, this luxurious complex is right across the street from the beach. It is 15 stories high with 121 units. Amenities include: 166' infinity pool | volleyball pool | swim-in spa | lobby bar | movie theater | fitness center | teenage game room | guest suites | on site management | concierge.